As its title suggests, Healing probes the process of dealing with loss, coping with regret, and moving on to a more positive future. Director Craig Monahan has said that making the film was part of his own healing process, following the death of both of his parents during the years that the film was in development. 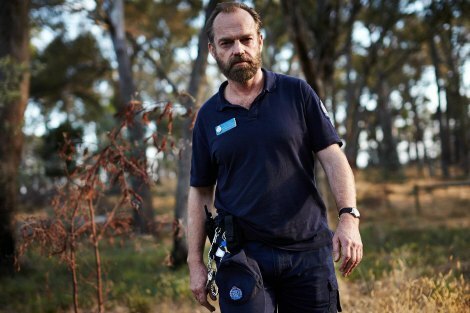 Hugo Weaving's character in the film is inspired by a real-life minimum-security prison officer whose daughter had died. Such a program and process lies at the heart of Healing. 'I'd read a number of drafts,' says Weaving, who has shared a working relationship with Monahan ever since he starred in the director's feature debut, the menacing police drama The Interview, back in 1998. His character Matt, like his real-life counterpart, is a bereaved father, and his all-but silent grief lends considerable weight to Weaving's gruff portrayal. 'It is not demonstrated in any great depth, but you understand the magnitude of his grief and what he's trying to deal with,' says Weaving. Matt is inspired to initiate the program not just by his own grief, but also by his observation of the film's hero, Viktor (Hany), an Iranian expat and inmate who bears his own deep emotional scars. Viktor is at the tail end of a prison sentence for murdering a friend. During the course of the film he must confront not only his sense of guilt over that deed, but also try to heal the family relationships that have been damaged by his errant ways. His care for the raptors mirrors and enhances this process of self-healing. As part of his research, Weaving spent time at some of Victoria's minimum-security prison farms, and hopes that the insights gleaned from these experiences will illuminate for audiences this often-unseen aspect of the justice system. 'It's a prison film and yet you're in a facility that not many people know about,' he says. 'At these facilities there's a great deal of trust and quite strong relationships between prison officers and inmates. Healing's strongest attribute is its cinematography. Its images of birds in flight or repose stand as poignant metaphors for the ebb and flow of human dignity, the fragility and resilience of the human spirit, and the burgeoning self-respect. If the story is a bit thin at times, and the dialogue stilted, this is balanced by the gravity of the theme and by the performances of Hany and Weaving, as their characters push back with increasing resolve against the weight of grief and regret. In this regard it, like its characters, achieves transcendence. Tim Kroenert is the assistant editor of Eureka Street. My mother's recipe book has been part of my life for 60 years. Every entry is handwritten, and the handwriting conjures up the person. But the book is a historical document for other reasons, for in it my mother has also written out the recipes she learned in my Greek mother-in-law's village kitchen. Yiayia was illiterate, so my mother had to observe and make notes. The book is, in a sense, part of the story of two mothers. Pilgrims arrive to the hiss and gush of bus brakes and it is always the liturgical season of steel. Dockets fly like white moths; we communicate in glance. Our Lady of Perpetual Retail lives here ... You have every reason to steal. In spring Boronia brings its breath of silent spaces not for sale in this temple.